Tatti," Gershon said to his father on Shabbos afternoon, "listening to the Torah reading in shul made me wonder. We read all about the building of the Mishkan and the many different materials used to build it. But I remember learning that the Beis HaMikdash was built only of stone. Why is that?" "That's a very good question, Gershon," replied his father. "I'm very pleased that you follow the Torah reading and think about the parshah. Perhaps we will be able to understand this if we take a closer look at the materials which were used to build the Mishkan." "Well, the roof was made of animal hides," said Gershon, "the walls were made of cedar wood and their bases, the adonim, were made of copper." "Think about that for a moment, Gershon. Does it look like those materials just happened to be picked, or can they be representing something?" "Oh I get it! In class we learned that the world is made up of four general types of things - people, animals, plants, and things which don't have life, like stone or metal. So here we see it - the Mishkan is made of things coming from animals, plants and metal." "That's right, Gershon," his father complimented him. "HaShem commanded the Jewish people to build the Mishkan, and promised that He would dwell in it. By using the elements which make up the world, HaShem's holiness comes down and is revealed in this world." "I understand," nodded Gershon. "But what about the Beis HaMikdash? Why was it made only of stone?" "Let's try to understand. Remember when we went to Eretz Yisrael, and you wanted to climb the ramp that leads behind the Kosel? "Yes, and you told me that we're not allowed to go up there. I remember you said it's not because the goyim have their mosque there. It's because we're tameh, and can't step on the holy ground of the Beis HaMikdash until we purify ourselves with the ashes of the Parah Adumah." "That's right, Gershon. But think. If the Beis HaMikdash is not there, why is the ground still holy?" Gershon paused to think, and his father continued: "In the Beis HaMikdash, the Shechinah was revealed in a way that made the mountain itself holy. Once that holiness was revealed, it will never depart. "But the Mishkan was different. The place on which the Mishkan stood was considered holy only as long as the Mishkan was there. 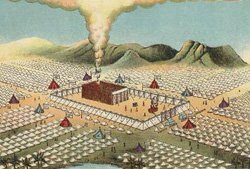 Once the Mishkan was moved, that holiness no longer remained. Why? Because it was not meant to be a permanent dwelling. It was not permanent because its holiness was revealed from Above, and did not come because of the Jews' avodah. "And this is why different materials were used when building the Mishkan and the Beis HaMikdash. From the Mishkan, we see how HaShem brings down His holiness into this world. The roof of the Mishkan was made from animal hides, the walls from wood, and the sockets from metal. This shows how HaShem's holiness comes down, first to the level of animals, then lower to the level of plants, and finally to the lowest level, things which have no life. "But the Beis HaMikdash was made only of stone, showing us the power of man's avodah. Man can take a stone - an object that shows no life at all - and make it part of HaShem's dwelling. The entire Beis HaMikdash was made of stone, because its holiness did not come only from Above, but was brought about through man's avodah."